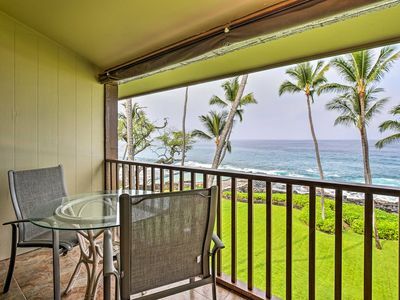 Oceanview 1BR/1BA at Kona Reef. Desirable F bldg, Free WiFi, Newly Upgraded. 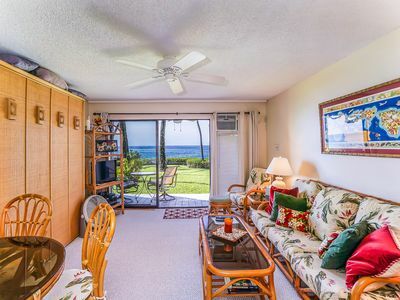 This lovely condo with the entry at parking level has a roomy lanai that is1 story above ground. 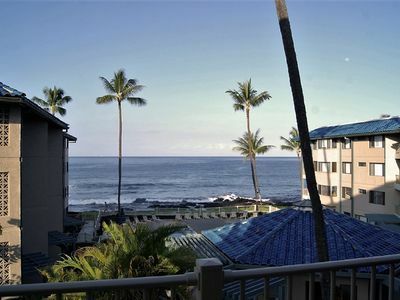 This 1 bedroom, 1 bath condo features a superb ocean view overlooking the pool that makes the Kona Reef resort unique. Mobility impaired friendly: no steps to the condo or pool, and only a few level feet away from your vehicle. The daytime property management office is just 4 units away. This is a vacation rental that was newly renovated last year. 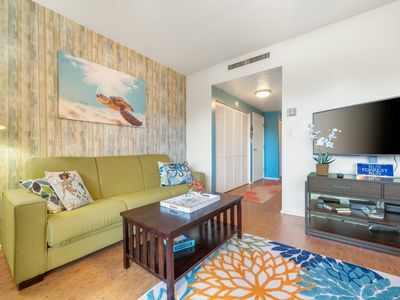 This 1 BR unit features a clean and uncluttered Tropical look with Island touches throughout. Enjoy the new furniture in your air-conditioned living room. Enjoy the new walk-in-shower with grab bar and the largest outdoor lanai in the complex. 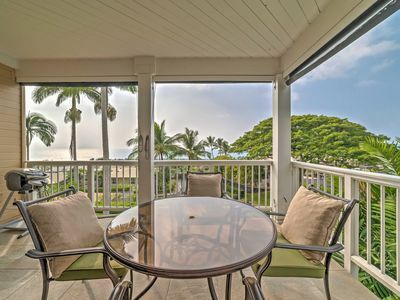 On our lanai, you can converse normally without loud ocean noises and salt spray that affect the ocean-front units. 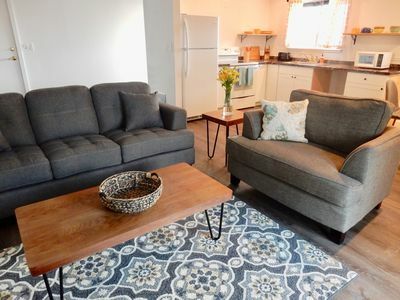 Our Condo (F2) is equipped with everything needed for a comfortable stay, including a full well-equipped kitchen with cookware and dinnerware, so you don't have to do dishes after each meal. Flooring is bamboo and tile throughout. A 48”wall TV is in the living room with an integrated CD/DVD player and a wall TV in the bedroom. The condo has a selection of books and DVD’s for your use. Boogie boards, Tommy Bahama chairs, noodles and beach towels, are provided; daily or weekly snorkel rentals are available next door in the property management office. 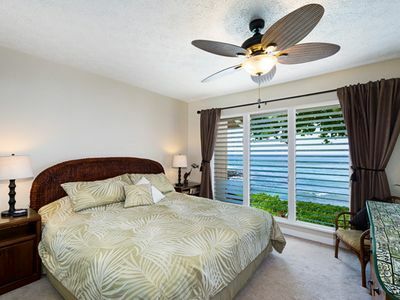 There are three ceiling fans to augment those trade wind breezes. 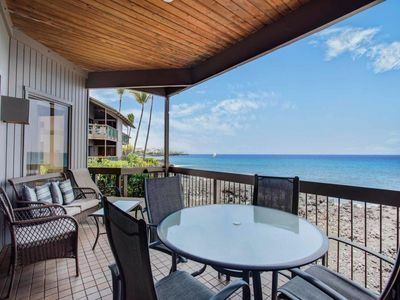 Bring your cameras and binoculars to see dolphins and whales in season, parasailers, large cruise ships, Hawaiian outrigger canoes and tropical sunsets right from the condo Lanai. Surfers and sunbathers gather daily at Honl’s beach which adjoins the property. A new king bed in the bedroom and a new queen innerspring mattress in the sleeper sofa which provides comfortable sleeping for up to 4. All linens are provided. F2 is also equipped with high speed Internet Wi-Fi, cable TV, and telephone with free long distance calling throughout the US and Canada. A new washer and dryer complete the extensive amenities list. Onsite property management is available 24/7 to resolve any issues. 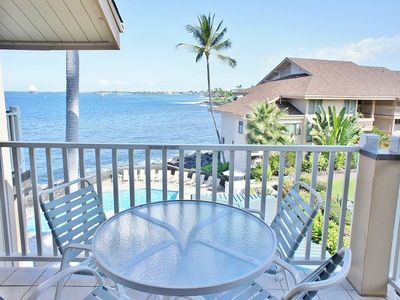 While very affordable, the Kona Reef has great amenities and friendly people, with an exceptional oceanfront pool and spa surrounded by palm trees where you can catch some sun and relax with a stupendous ocean-sunset view. A BBQ cabana in the pool area has four large, meticulously-maintained gas grills where you can cook your meals and dine. The condo has a full set of BBQing utensils and containers. 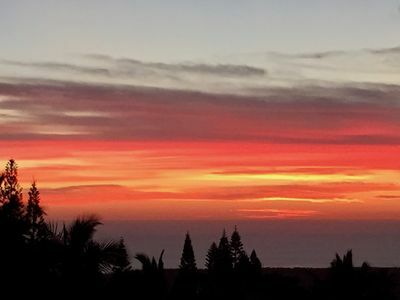 And of course, if cooking is also something you want a vacation from, the Kona Reef is only two blocks to town… you can easily walk to many restaurants, shops, local markets and more. Enjoy the night life, and return to quiet Kona Reef at the end of the evening! 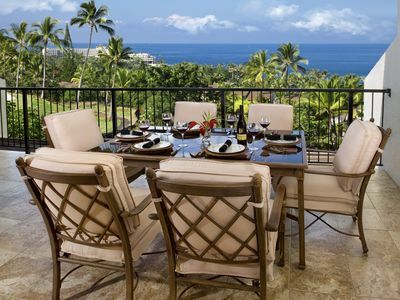 Whether you come to experience Kailua Kona’s Iron Man, the Billfish tournament, Volcanoes National Park, Mauna Kea observatories, Hilo’s Orchids and waterfalls, Coffee Plantations, Waikoloa golf, Macadamia Nut farms, sunset cruises, or swim/scuba with Manta Rays, Kona Reef F2 is perfectly situated. 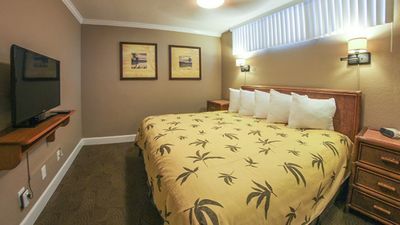 We own or manage multiple units at the Kona Reef. If one is occupied for the dates you want, one of our others is probably available. 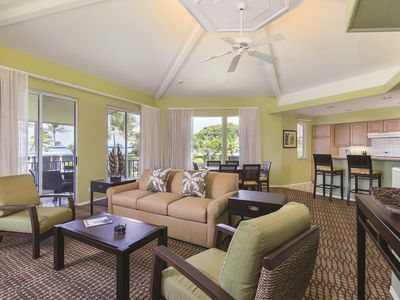 We offer four different ocean front two bedroom units, and 9 different 1BR ocean front units. 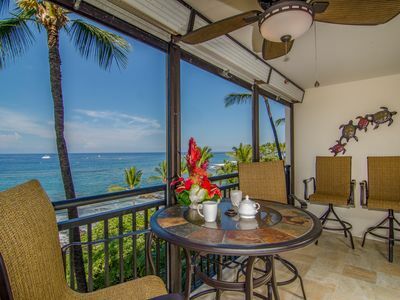 In addition, we offer 12 different ocean view 1BR units. If traveling with others and hoping to have a few units close to each other, we can help. All are well maintained and comfortable. Just click the link below that says 'see our other rentals' and you will be able to view them all. Feel free to contact us for more information. 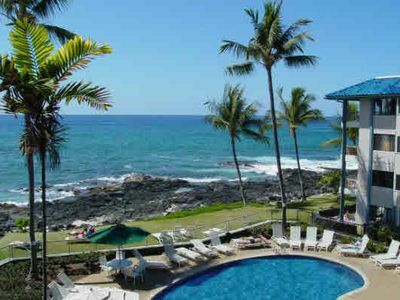 Reserve early, the Kona Reef is one of the most popular locations for a stay in Kona and is often sold out long in advance. 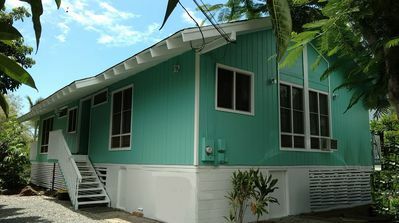 It is just a block and a half from town, has a beautiful ocean front pool, spa and BBQ area, and is affordable. 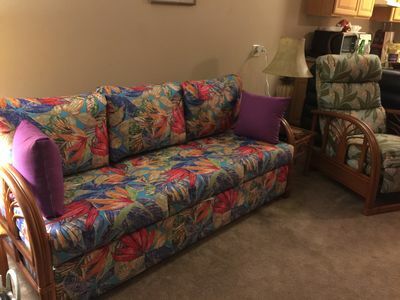 That is probably why so many guests return to the Kona Reef year after year. We are sure you will be one those returning often, too. 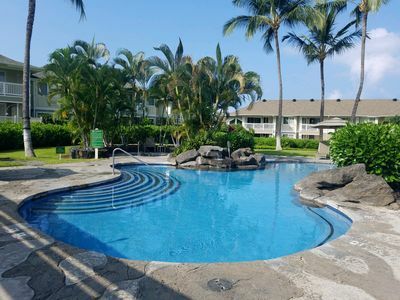 Ocean View Kailua-Kona Condo w/ Community Pool! NEW! 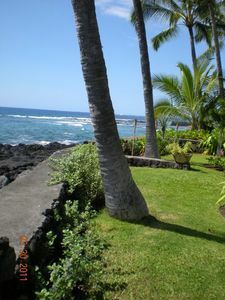 Oceanfront Kailua-Kona Condo w/ Pool Access! 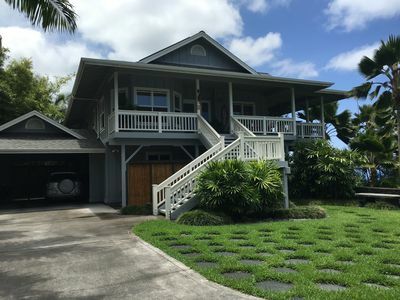 *New* listing in Kailua-Kona , 2/2 fully renovated and remodeled duplex.